Kellyanne Conway said he was under "political character assassination." 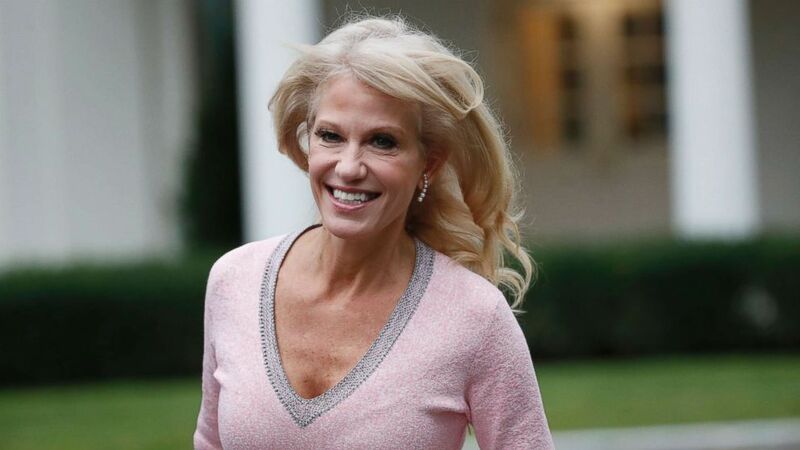 Conway, in an interview with ABC News Chief White House Correspondent Jonathan Karl on “This Week” Sunday, pushed back against the notion that many people may see now-Justice Kavanaugh as tainted due to his being confirmed to the Supreme Court despite allegations of sexual misconduct and sexual assault against him. (Alex Brandon/AP) Kellyanne Conway arrives at the White House, Sept. 27, 2018. 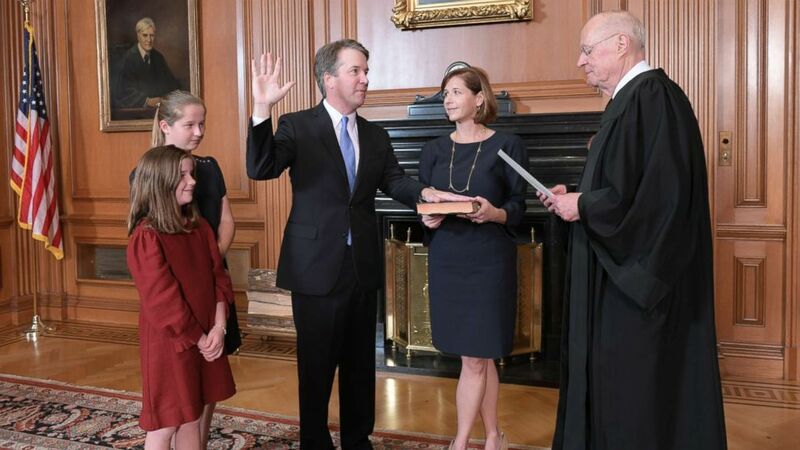 Kavanaugh was sworn in as a Supreme Court justice late Saturday after a tense 50-to-48 vote in the Senate that was repeatedly interrupted by protesters shouting in the gallery against the confirmation. His nomination had been rocked by sexual misconduct allegations stemming from his time in high school and college. Christine Blasey Ford alleged he sexually assaulted her at a small house party when they were both teens in high school. A former Yale University classmate of Kavanaugh's alleged he exposed himself to her at a college party where there was drinking. 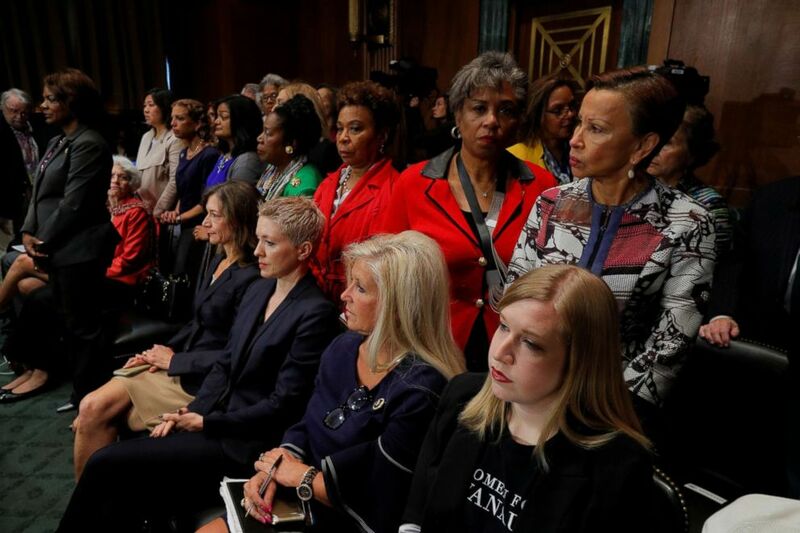 (Jim Bourg/Reuters) Female members of Congress stand in protest behind seated supporters of U.S. Supreme Court nominee Brett Kavanaugh, as members of the Senate Judiciary Committee meet to vote on Kavanaugh's nomination on Capitol Hill in Washington, Sept. 28, 2018. The women standing were warned by U.S. Capitol police they would be forced to leave the room if they continued to stand. Conway slammed the media for what she called the framing of a general narrative around sexual misconduct in which every woman is a victim. "Let’s stop pretending that there’s moral authority by some, including many in your industry," the counselor to the president said to Karl. "I didn’t say you, but many in your industry have lost their moral authority to pretend that they were looking for the truth, that they were on some kind of fact-finding mission, when ... they’re not even covering his testimony that he has denied under oath that this has happened, and they want every woman to be a victim, every woman to lock arms and ... every man is a perpetrator." (Fred Schilling/Collection of the Supreme Court of the United States via AP) Retired Justice Anthony M. Kennedy, right, administers the Judicial Oath to Judge Brett Kavanaugh in the Justices' Conference Room of the Supreme Court Building, Oct. 6, 2018. Conway continued, "We can’t live in a country where democracy and the First Amendment and due process and fairness and the presumption of innocence thrive" amid such assumptions. She also said that no Supreme Court nominee “has been more picked apart” than Kavanaugh, except possibly Justice Clarence Thomas, who was also accused of sexual misconduct during his 1991 confirmation process. She asserted that Kavanaugh should not be seen as “tainted” considering his record as a federal judge and the thoroughness of the process to confirm him to the high court. 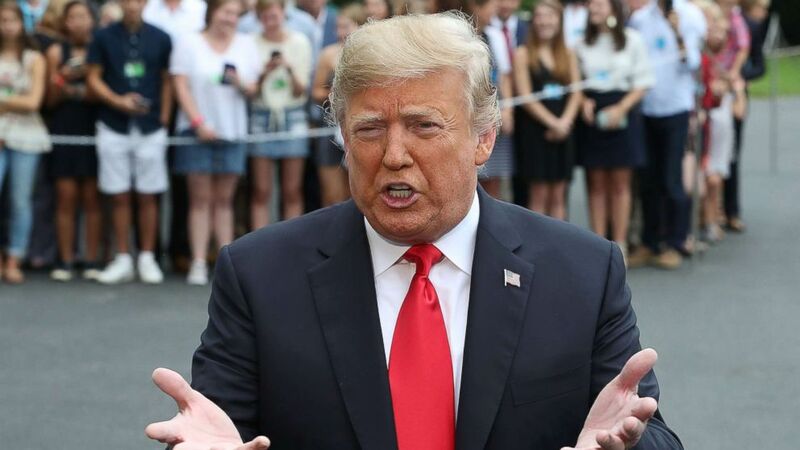 (Mark Wilson/Getty Images) President Donald Trump speaks to the media about the upcoming Senate vote on Brett Kavanaugh before departing the White House, Oct. 6, 2018. "He should be seen as somebody who went through seven FBI investigations, including just in this last week, another one that was completed this past July; had answered 1,200 written questions; had produced about a million pages of documents, submitted himself to about 33 or 35 hours of sworn testimony to the Senate," Conway said. She added, "The Supreme Court, thank God, is a sacrosanct institution that can withstand much, and it will withstand the fact that there were a lot of political machinations" in the confirmation process for Kavanaugh. Conway did not answer directly. She said both of Trump's appointees to the court, Neil Gorsuch and Kavanaugh, said in their confirmation hearings "that Roe is settled law." "So that was a broken promise?” Karl pressed, on overturning Roe v. Wade. Conway continued, "Most Americans don’t actually know what Roe provides and does not provide ... People are going to look at state law and [federal court decisions] and they’re now going to look at issues like late-term abortion ... They’re certainly going to look at abortion after nonpartisan scientists and doctors [said] a fetus can feel pain." Sen. Maizie Hirono, D-Hawaii, who appeared on "This Week" after Conway, referred to her comments on abortion rights. Hirono said she expects that with Kavanaugh now a justice, the Supreme Court is unlikely to directly overturn Roe v. Wade but "will nullify it pretty much" by allowing state restrictions on the right to abortion. "As Kellyanne said, the states are very busy passing all kinds of laws that would limit a woman’s right to choose," Hirono said. "It’s those things that will go before" the Supreme Court.